If you are new to microformats, you might be wondering exactly how microformats affect SEO, Search engine optimization (SEO) is a topic that is constantly and consistently studied by web developers, content writers, and website owners as it is constantly changing and improving - The obvious purpose of the search engines is to supply the most pertinent results to the user that is searching for information. By adding microformats, search engines are able to parse local queries, thus providing more relevant results and creating a more targeted experience for the end user. If you want an effective, but basic method of creating a semantic markup that will increase your SEO, microformats are the answer. Simply said, microformats are snippets of code that search engines or browsers can read and comprehend, rather than basically displaying the information. Microformats convey several types of information, including contact information, calendar events, geographical coordinates, products and reviews, social relationships (XFN), and this is only the beginning. Microformats Provide "Search Engine Understanding"
Search engines are smart enough to "read" and display the data on a web page, however they do not necessarily comprehend the information or the associations that occur within the data. Microformats bridge this gap by assisting the search engine robots with parsing the data that is on your website. These "snippets" of information provide content, as well as a relationship within the content, which the search engines can comprehend easily now, providing a new method of creating SEO-rich content within the HTML. In May of 2009, Google launched a unique feature called "rich snippets", which are able to index and display information in a smart and efficient way, increasing SEO abilities. Google will read, display, and comprehend "Richard Johnson" as your full name. This same style of microformat markup can be used for your address, phone number, picture, email, homepage URL, and you can even display your nickname this way. The hProduct microformat allows for plenty of data in its markup. 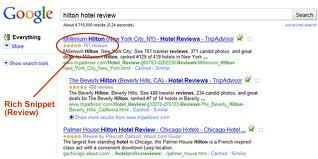 You can also implement more information, including relevant reviews, images, identifiers, and even more. When Google reads this snippet, it quickly understands that all of the information included is related, as well as how it is related. For instance, instead of reading $99.98 as a random number, Google will relate it to the product and understand that it is the price. Google is not the only search engine that easily comprehends microformats; Yahoo now understands them, and several others are joining the ranks. The implementation process is straightforward, which is great for developers. And, as the rate of developers who are using these microformats increases, search engines will certainly expand and enhance their abilities to include the use of this information for SEO purposes. The end user has a better experience with this enhanced SEO method, as they obtain more relevant search results and the web is becoming a lot more semantic. As mentioned before, local companies can reach their target market with microformats, and the SEO that they achieve with the microformats allows local end users to find the company faster and easier within the search results. If you study SEO practices, you will want to look into and understand microformats in order to achieve better SEO. It’s not a new language; it is a basic and new way of displaying the information on your website – or the website that you are developing for someone else. If you manage a website for a local business that caters to a specific area and you want to improve the SEO, microformats may help your website show up in the local listings for search engines. Microformats provide accurate and precise information for SEO, assisting you with higher and more effective rankings. If you are interested in learning more information about microformats and how to effectively use them, you can visit Microformats.org.